We buy houses no matter the condition or circumstance in Richmond Heights, Missouri. Several things have to fall in the right place, however, for sellers to actually take advantage of the imbalance in home supply and demand, and sell houses fast. This is one our valuable insights at House Sold Easy as we buy houses across the various Missouri markets in our over 10 years in the real estate business. By one industry estimate, we have gathered too that the current average time for a property to sell in many markets ranges from six to 12 months, despite the low market supply. Certainly, this sales time span of months is not quick enough for those who really are pressured to sell houses fast. There are several reasons why a residential property may take too long to sell even when inventory is low and demand is high. Marketing via the traditional way—that is through the Multiple Listing Service (MLS) as provided by a realtor, broker, or agent—won’t ensure a fast sale too even with this imbalance. Overpricing is one common reason why sales-listed homes linger too long in the market. The seller, for one, may have been misled or misinformed, deliberately or otherwise, into believing that the property is worth more than its fair market value. Hence, at House Sold Easy, we buy houses with a firm commitment to always come up with a fair price. This we do by looking at the residence, its location and condition, what repairs are necessary, and the values of comparable sold properties in its neighborhood recently. We examine closely the local market, especially so that home values have taken a huge dent as a result of the last real estate crisis. Notably, prices still haven’t recovered in many market areas. In Richmond Heights, for instance, it was estimated that the median price for September has softened to $195,000 compared to the $239,900 estimated median price for the past 12 months. Having this market-oriented mindset, our confidence is always high as we buy houses not only in Richmond Heights but also in neighboring communities of St. Louis. But unlike other market players, like commission-based agents or brokers, we at House Sold Easy are investors who take risks and are willing to pay quick cash for those who want to sell houses fast. We don’t list houses in the MLS, that’s for sure, and therefore, we are not focused on sales listings that could go stale in the market. At House Sold Easy we deal with both home sellers and property buyers directly. What’s great about our setup as we buy houses in various locales is that we can act with dispatch whether the market is up or down, inventory is low or high. All told, what’s really important for us is to arrive at a price that is fair and equitable for a mutually beneficial transaction. 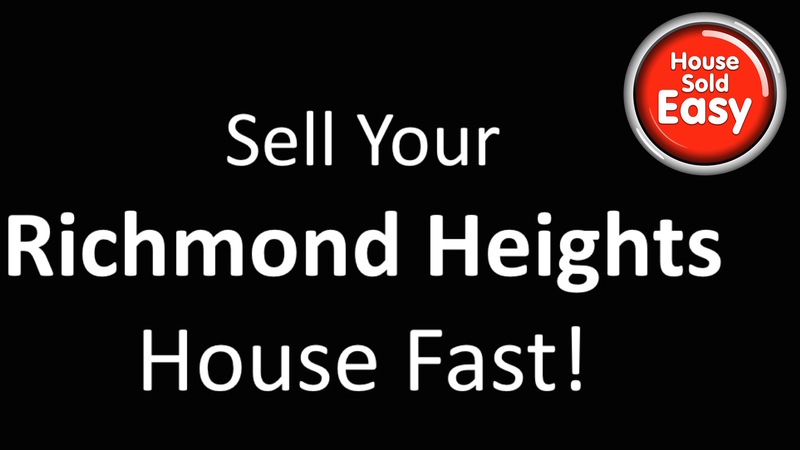 Call us today at 636-525-1566, to learn more about our tried and tested formula that has helped many to sell houses fast in Richmond Heights.